“This is the day that the Lord has made,” so said the ancient psalmist (118:24), “let us rejoice and be glad in it.” The certainty that God makes things is firmly imbedded in the religious psyche. The apostle Paul was sure he knew what God was like, and the beginning of this wisdom could be found by observing the world: “Ever since the creation of the world his eternal power and divine nature, invisible though they are, have been understood and seen through the things he has made.” (Romans 1:20). If you push most people of faith to explain why they believe in God, sooner or later you’ll hear, “Well, this world didn’t just happen. Someone had to make it!” And, of course, Genesis 1 tells how it all happened. Sometimes we’ll even be reminded of William Paley’s famous 1802 analogy of a watch found on the ground, “while crossing a heath.” Of course the complicated timepiece had a maker, so how can we not see that nature itself—so much more intricate—must have had a maker as well? These days, of course, Intelligent Design crowd is in our face to push the fine-turning argument. ‘Intelligently designed for life’ could be theism grasping at straws. We might even be in for a big surprise if we find life on thousands of other planets is mostly microbial. One SETI (Search for Extra-Terrestrial Intelligence) scientist glumly observed that she would be disappointed if most life elsewhere turns out to be the equivalent of pond scum. Would the Intelligent Design theists even care? They seem confident that God had humans in mind from the very beginning: We are the goal of creation. In fact, Francis Collins—yes the genome specialist—thinks that God wants fellowship with humans. This has to be one of the strangeness things I’ve ever read. The creator of the Cosmos wants fellowship with 6 billion humans? It’s one thing to imagine an Intelligent Designer who sparked the universe—and tweaked it in certain ways that allow life—but on what evidence does Collins suppose that this Cosmic Force craves human company? (Hint: the theologies of Paul and the gospel writers are not evidence). Indeed, what kind of fellowship could that be? I suspect that many of the 6 billion humans would have no interest—and would not even be eligible. Evangelicals know very well that unless you’ve accepted Christ—“No one comes to the father except through me” (John 14:6)—the fellowship is not an option. As a thought experiment, lets run for a bit with these two ideas, that Intelligent Design is a thing, and that God waited patiently for humans to show up so that he could have fellowship with us. If we’re meant to have this precious connection with the Lord, wouldn’t that mean that God has our best interests in mind? And, like a true friend, wouldn’t he, using his full powers, spare us as much anguish as possible? 1. Once God had inserted humans into Earth’s complex biosystem, we needed a lot of information to cope. Why did God let us down? He decided to let us figure out stuff on our own. For example, was it negligence—or does God have a malicious streak?—that he decided not to tell us, thousands of years ago, about microbes? That discovery, with Antony van Leeuwenhoek’s invention of the microscope in the 17th century, provided prospective on who and what we are. Maybe God wanted to keep it a secret that humans aren’t the dominant species, after all. From the second we’re born, our bodies wage war against the nasty microbes; but no matter how many battles we win against them, in the end, they win. Then they eat us when we’re dead. We marvel at the achievements of science in fighting microbes, reducing our suffering, giving us longer lives. Why did God withhold such important information? Humans descended into advanced hysteria at the time of the Black Death in the 14th century—perhaps a third of the European population died in utter agony—because of the certainty that God was punishing sin. But God remained aloof: “Oh well, let them believe what they want.” What kind of benevolent Intelligent Designer would do that? Why not let us know how our bodies work? How diseases happen? Supposedly, according to the official Christian line, he did want to share information with us. But what did we get? A thousand-page ‘sacred text’ packed with folklore, religious fantasy, superstition, magical thinking, and bad theology (‘chosen people,’ ‘promised land,’ and ‘a messiah-to-save-us’ are all bad theology). Hector Avalos is oh so right in his observation that, “going verse by verse, 99 percent of the Bible would not be missed.” That’s not the book we needed! 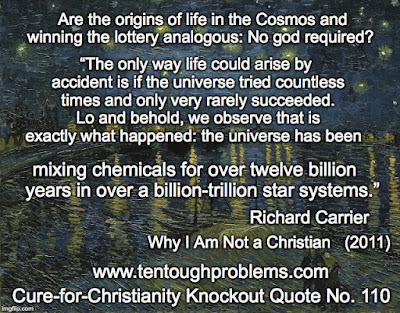 Supposedly Intelligent Design, the fine-tuning of the universe, means that life could be abundant in the cosmos—unless Christians want the Creator all to themselves—so perhaps Intelligent Design has to do with the quantity of life out there. But in terms of the quality of life down here on the ground, God screwed up. Suffering could have been reduced immeasurably if the ‘sacred text’ so long ago had been about anti-biotics, aspirin and Novocain, electricity, refrigeration, dental hygiene—this list is endless. 2. Why did God blunder so badly when he designed the human body? Intelligent Design advocates are pretty sure that the eye makes the case that our bodies were designed. But we now know that this argument is false; the evolutionary development of the eye is well understood. Actually, that should be ‘eyes’ because nature came up with many versions of the eye in various creatures. And there are design flaws in the our eyes. For details about this, see chapters 21 and 22 of Abby Hafer’s book, The Not-So-Intelligent Designer: Why Evolution Explains the Human Body and Intelligent Design Does Not. In fact there are ten chapters in her book about badly designed human body parts, e.g., testicles, throat, birth canal, teeth, genome. What would have been the Intelligent Designer’s motive for the invention of hundreds of genetic diseases? If God is in these details—well, who wants that kind of God? And then there’s death, of course. All things die, everything from microbes to stars. But we are entitled to wonder if the aging process couldn’t have been better imagined. We biodegrade while we are still alive; the suffering entailed as we wear out our bodies is incalculable. Intelligent Design can also refer to the political strategy advanced by evangelicals. For Abby Hafer’s analysis of this, see her essay, “Intelligent Design Isn’t Science, and It Does Even Try to Be Science,” in John Loftus’ 2016 anthology, Christianity in the Light of Science: Critically Examining the World’s Largest Religion. 3. Another Intelligent Design breakdown: the natural world is a war zone. Despite hard human labor, we sometimes fail to manage an adequate balance between available resources and human need; hence famine and starvation have been constants throughout history. 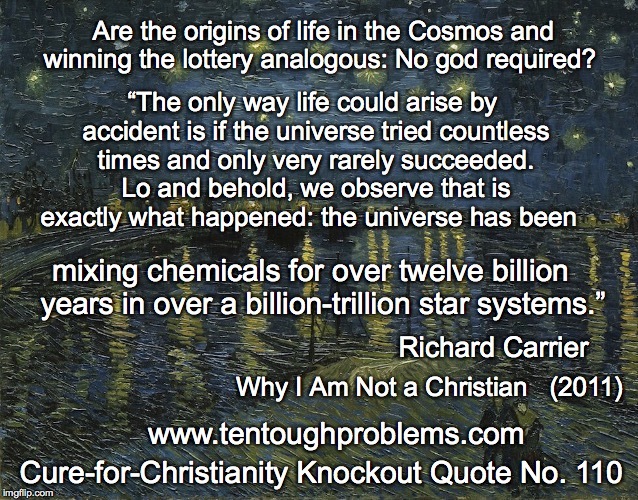 The Intelligent Designer didn’t manage to work that one out before depositing us on this planet. Moreover, we have to deal with hurricanes, earthquakes, and volcanoes; the Indian Ocean tsunami in December 2004 killed 226,000 people. Theists, who have become specialists in the ‘easy acceptance of the very terrible,’ brush these aside as works of nature that we just have to live with—anything to exonerate God. But the violence of this planet—on which, in his benevolence, God located us—does him no credit as an Intelligent designer. In December 2004 a quarter of a million people, whom God supposedly wants to “have fellowship with,” didn’t feel the love. We’re just one tiny planet, of course, one among billions in our galaxy alone. Why would we rate any attention at all in the grand scheme of things? But if there is a Master Mind plotting everything, it’s a nasty way to treat our little fragment of creation.